Most of the Android users are looking for the easy way to install custom ROMs, recovery and unlock the bootloader. To all these steps you have to do everything manually one by one, and most of the users are not tech savvy enough to do everything on their own. Thanks to XDA Senior Member ssrij created who create the new tool called CustomDroid. With the help of this free application you can unlock the bootloader on selected phones, flash custom recovery, and ROMs too. Currently the app support to Nexus 4, Nexus 7, Nexus 10, Galaxy Nexus, Nexus S, Nexus One and HTC One, Support for more devices will be added soon. The app works same like the CyanogenMod Installer, which you can use to install CyanogenMod ROM on a number of devices. But with that application you can only install CyanogenMod ROM, not other ROMs. To install other ROM you have try this new application CustomDroid. 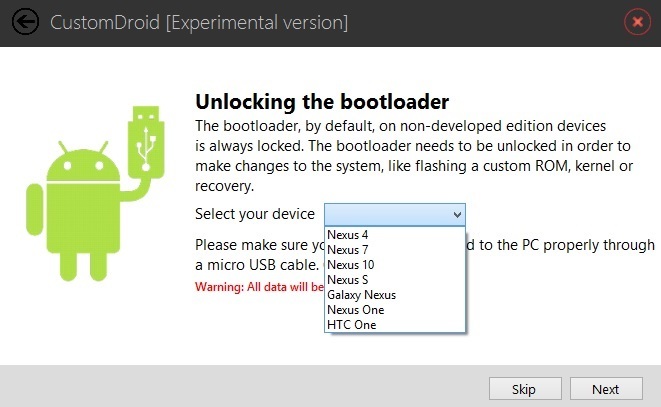 To run this application on your Windows PC you need a ADB/fastboot drivers. Once the application is installed, all you have to connect your device from the desktop. On the main screen of the application you have to select your device name and hit the next button to unlock the boot-loader of your device. As we already mention above that currently application supports only few android devices. Once the device is selected from the Screen, you can easily install recoveries and Custom ROM on your device. 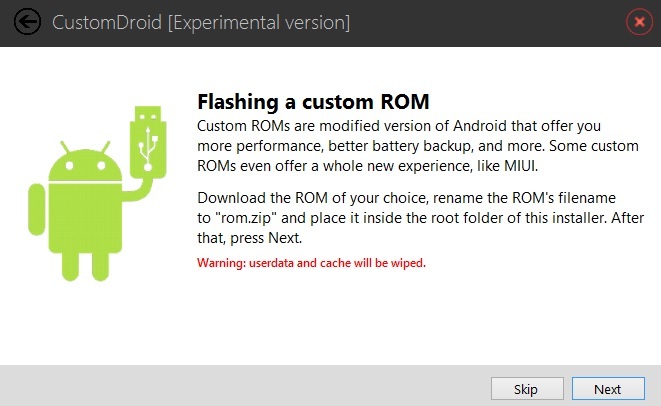 To install the ROMs on your device, First you have to download the rom on your desktop and rename the ROM file to “ROM.zip” and place it inside the root folder of the application. For more information about thew application and to download the app on your system visit this XDA forum thread.